DEAR GAYNELL: Good news! You can have stucco applied to your brick home. What I can't answer is whether or not you possess the skills to apply exterior stucco. Not only do you need hand-eye coordination, you will need certain tools and equipment. These challenges are not insurmountable, but they can create issues. You can rent the needed scaffolding and a powered mixer that will be required for this job. Brick, concrete block walls and even poured concrete walls are excellent surfaces to stucco. It is a common practice to stucco exposed poured-concrete foundations to mask the irregularities created by the wood or metal forms. 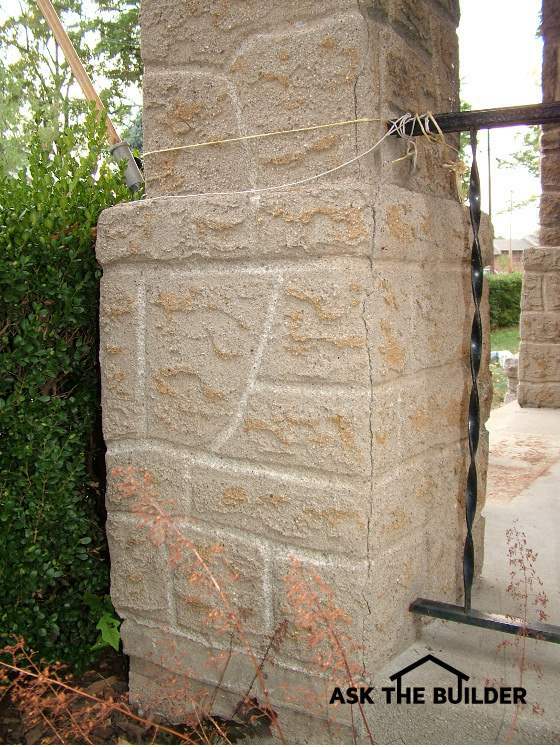 Stucco also does a splendid job of hiding mortar joints in concrete-block walls. The first thing to do is to inspect your existing brick. It must be in good condition, clean, and free of all dust. Now is the time to correct any water-infiltration issues. If flashings above or below windows and doors are inferior, you want to correct these issues now. There are many wonderful stucco manuals and guides that show how to install flashings around windows and doors. Applying stucco is almost always a two-step process. You typically apply a base or scratch coat that is approximately 3/8-inch thick. The stucco mixture is a combination of clean sand, masonry cement and Portland cement. Masonry cement is often a mixture of Portland cement and hydrated lime. You will discover that if you mix one part Portland cement plus one part masonry cement with eight parts of clean, damp medium sand, you will get a splendid base stucco mix. The same proportions can be used for the finish coat of stucco. Before you start to apply the stucco to your home, I suggest you practice first. You can do this by building an 8-foot wide by 8-foot wide wall from 2x4's. Cover the studs with 1/2"-inch-thick cement board. It is important that you get comfortable with the tools and techniques of applying the stucco. Be sure this temporary wall is secured well so it does not tip over or is blown over by the wind. Once you feel proficient, then consider starting outdoors on the walls of the house you rarely see or can't be seen from the street. You want the most-visible walls surfaces to be stuccoed last after you have discovered how to do a great job. Don't worry about perfection when working with the base coat, since it will be covered with the finish coat. You want the base coat to be somewhat rough so the finish coat bites into it. Prior to applying the base coat of stucco, be sure to get the brick wall damp by misting it with a hose. The brick you cover with stucco should always be damp just before it is coated. Try to avoid working on hot, dry windy days. The best conditions to apply stucco are on overcast days with the temperature in the 50-60 F range. Since you can control when the stucco is applied, do not apply any stucco if the temperature will drop below 32 F within days of applying either the base or finish coat of stucco. One of the best aspects of stucco are the infinite types of textures you can create. I don't know that there are any I would avoid, although I would try to do a texture that is a simple two-step process. When you apply the finish coat of stucco, try applying it in a random fashion and then overlap the different strokes slightly. 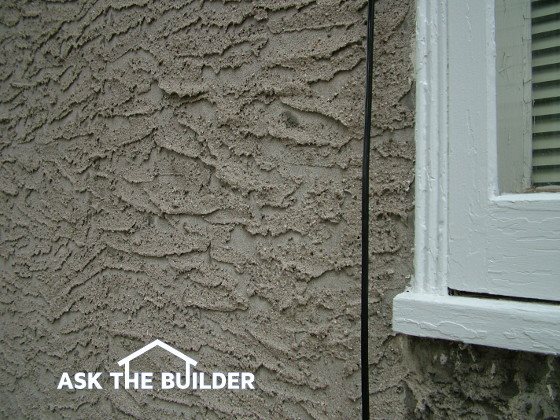 The finish coat of stucco should not exceed 1/4-inch in thickness. Experiment with different textures on the temporary wall where you learned how to apply the base-coat stucco. Stand back from the wall about 30 - 50 feet to see what it will look like from the street. All too often stucco rookies think a texture looks great as they apply it, but the relief and texture disappears when you stand back from the wall surface. Look at the texture at different times of day, especially if you want a rough texture that creates shadows. The biggest challenges one faces in a do-it-yourself stucco job is mixing the stucco and getting it to the work location. To get professional results, the person applying the stucco needs to be fresh and concentrating on applying the material, not worn out from mixing and wheelbarrowing stucco mix around a jobsite. If at all possible, try to arrange for a helper. To ensure both color and texture match, all materials for the job should be purchased at the same time. Sand purchased from two different suppliers can be very different in both color and particle size. If you run out of sand part way through the job, you may not be able to get matching sand. This is not too critical with the base coat, but it is imperative you use the same sand on the finish coat. Portland cement and masonry cement can also be slightly different colors. Buy enough material for the entire job and keep the cement in a garage where there is no risk of getting wet from the rain. Dear Tim, if my husband stucco's our brick house like I want, what do we do about the brick ledges under our windows? Do we stucco over that brick as well or grind them down in order to make flush with the rest of the exterior wall? I'm wondering what our options are and concerned that we keep it so rain can run off away from windows. But I'm not sure I've ever seen ledges like that under windows on a stucco house? Hope I made sense? Thanks for any visual help you can give me. For detailed questions like this, this is what my 15-Minute Phone Consult is for. You have many things to consider in this job. Hi, I just moved into a new house and noticed there are a couple water stains under my front window. It also could be something else that was there before. Looks like a water stain if you threw a water balloon at it. How can I remove it? Shauna, you need to schedule a 15-Minute call with me. There's simply too much to talk about and type. I'm trying to stucco over cement baord on the exterior of a shed. I'm useing 1/4" cement baord as my base over the house wrap and a morter/stucco mix type "S". 1. Do I have to tap the seams? ... all of the seams are ver tight ... most are less than 1/8"
2. I wet the base before I stuccoed in all of the screw holes and seams before appling the stucco .... the finish looked good but, when the finish dries ... it feels like sand and can rub off ... I only did a 4' x 8' area .... I hope you can held so I can complete the project. THANK YOU ! Tom, your question requires lots of typing, plus I have some questions for you so I can give you the correct answer(s). I only do pithy answers here in the comment section. If you want to protect the investment you have in your house and not waste time or money *hoping* you make the right decision, you should talk to me on the phone for just 15 minutes. It'll be the best investment you've ever made in your home! Can straight horizontal or vertical grooves, about 1/4" deep and about 1" on centers, be applied on stucco exterior wall finish? If it can, what is the best way or a good way to do this? My proposed project needs 4'-0" long grooves. We want to stucco over the exterior of our slump block house in Arizona in order to add insulation. What are the pluses and minuses of doing this? Can you give us a formula of how to do it? Barbara, there's far too much to talk about. I offer a phone consult service. You should consider it before you make huge mistakes. Question: We bought an older farmhouse with stucco siding. The home was remodeled by turning a large garage into a family room with fireplace then another garage was added onto that. We want to place 13 x 11" iron grates into the walls, set high so has to convey heat from the woodstove/fireplace in the large converted garage area into the original home. We have decided where to place these high on the wall but when doing a test drill hole we found what appeared to be concrete. So.. we realized we are drilling into an exterior, stuccoed wall we presume. What is the best way to get through all of this stuff to place our vents? I'm building a backyard firepit about 4'x6' and feet tall. I'm using concrete masonry units as the base and regular red brick on top, I am going to create a stucco finish, I was curious about whether or not a should use a lathe on the surface of either or both the CMU or Brick in order to ensure a even texture or is this unnecessary in creating a smooth finish? Also since it will be a wood fire pit I planned on using Refractory Brick on the interior of the firepit but I was curious as to whether or not this will affect the stucco on the exterior particularly cracking? Fire brick on the INSIDE of the fire pit will help to keep the stucco on the outside intact. Create a 1-inch air space between the fire brick and exterior CMU. READ my past columns about fire brick and fire clay!!!!! Can you stucco over a stone basement foundation (interior)? Or don't they recommend this? Thanks! Yes you can! READ all my past columns about cement stucco and pay close attention to what I say about using "cement paint". That's the key to success. Hey I have question please. I am doing my own stucco first job and. Iam doing the finished coat right now and its acrylic texture finishe,and there are no expansion joints installed on the walls? Iam not sure what to do now?do I need to me fake expansion joints by chulk line?or just apply the finish coat and texture it? Hi I am stuccoing over cmus, everything I have read so far says that I don't need to use metal lathe. Is this your suggestions if I use a bonding agent?